A vast fleet of fifth dimensional Radionnic Ships of Light sits outside the orbit of Pluto. Thousands are projected into Earth’s fifth dimension at any time. Their presence creates a magnetic field reflection in Earth’s lower third dimensional; atmosphere in the form of a distinctive radial effect, not unlike the spokes of a wheel. 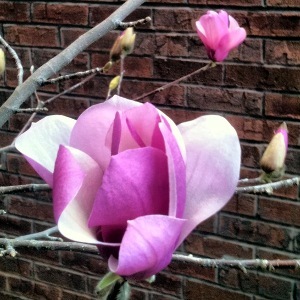 The radial effect is their signature. The fleet is called the Heavenly Host. This is what a Radionnic Ship of Light magnetic field reflection looks like. People all over the world are looking for flashing lights and other phenomenon hoping to prove the existence of UFOs in order to prove Man is not alone. They are looking in the wrong place The proper question isn’t ‘are there UFOs’, it is ‘what do they look like’. Supposed Ufos with flashing lights are not a sign of extraterrestrials. No matter what the shape, size, motion or complexity, flashing light machines are Man made. Inter Stellar and Inter-dimensional Beings do not need running lights to show them where they are going. Anyone thinking that they do clearly have not thought the matter through carefully. The Cosmic Circle of Fellowship circa, nineteen thirty nine stated that, ‘When He comes again, He will create phenomenon in the sky’. The phenomenon is now present and apparent for all to see in the form of the magnetic arrays now observed in Earth’s lower ionized cloud covers on a daily basis. The arrays are distinguished from chemtrails, contrails, and jet stream activity by converging to a focal point about twenty or thirty degrees above the horizon instead of at the horizon by parallax. Also by the fact that the fields stay put, sometimes for days, even as the areas of ionized water vapour pass through, sometimes still there when the original vapour signalling their presence may have moved on half way around the world. What you like to call ‘Unidentified Flying Objects’ consist of two types, the vast fifth dimensional Radionnic fleet of the Heavenly Host sitting outside the orbit of Pluto, and a thousand or so fifth dimensional tin pots which are quarantined around Earth in the aftermath of the Luciferian Self Will Rebellion of the Cosmic Overplus. The Van Allen radiation belt surrounding Earth contains higher frequency energy allocations which prevent the ships from mounting teleportonnic jumps. The tin pots are responsible for most of ytour so called abductions, who hopelessly seek to find ways through your human DNA structure to break out of the embargo. The ships from the Heavenly Host teleport into Earth’s atmosphere daily and sit bare faced in the noon day sun as the magnetic monopoles. They also appear as concentrated small white dots of condensed water vapour moving from one cloud cover to another. When they stop, their magnetic field has time to stretch out and consolidate whose presence is then visible as the obvious magnetic footprints in the lower cloud layers. Sometimes you might catch a Radionnic Ship in the act of teleporting in. It will look exactly like a large exclamation mark in the sky, In due course, a magnetic monopole reflection will have set up at the bottom of the exclamation mark. The projecting hosts also commonly ride along quietly in the Jet stream. Easily visible because of the intense ionizations of the water vapour identifying the stream. Seen as distinct monopole patterns sitting within the heavily ionized streaks of water vapour from friction within the stream. With the exception of the Jet Stream case, where a given ship will drift slowly along with the stream, a particular radial formation overhead will sometimes sit in the same place for days and days, becoming more obvious, then less, then more again as the water vapour densities in the cloud structures pass through the magnetic field in the daily passage of clouds from one horizon to the other because of the rotation of the Earth. The formations always appear as a pair of monopoles, not always obvious, consisting of a pair of scout ships which have set up a positive and a negative pole holding the main cigar shaped Mother ship suspended in the field between. The positive monopole is distinguished by a cotton ball like puff of cloud around the focal point center of the radials. The negative is distinguished by an absence of cloud at the focal point. The Mother ships are not mono poles, having both a north and south pole. Which is how the respective south and north monopole scout ships serve to anchor them. The two scout ship monopoles are always exactly one hundred and eighty degrees opposite each other in the sky. If you follow the radial lines emanating out of one pole, they will flow into the radial lines of the other. It is less common to see them both at the same time. If you watch the passing clouds for a while you can often see a pocket of moisture vapour creating good visibility at one pole, move along and suddenly start giving good visibility of the other. Similarly, a radial array may be perfectly visible in the morning and then not again for a couple of days through lack of proper ionized cloud moisture, then suddenly visible again, still in the same relative location. The Heavenly Host works hand in hand with the Christ voluntary on the surface of the planet. The ships teleport in when the Reality atom of a member of the voluntary Army of Christ needs to receive an inter-dimensional cue up or instruction, of which most are unaware in their outer third dimensional levels of consciousness. Similarly, Radionnic Ships will occasionally lower their frequency of visibility to the third dimensional band of visible light when someone’s Soul Atom deems them worthy see it in order to quickly raise them up into a new level of outer consciousness awareness. In which case they will be visible to the party as an absolutely pure silver disk. 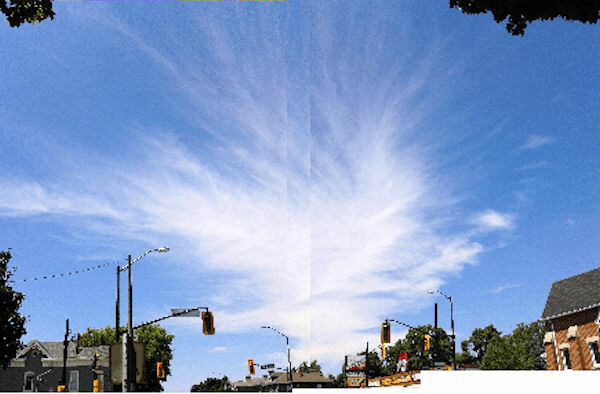 The following three pictures of radial formations were taken by disposable camera in Ottawa Ontario circa, mid nineteen nineties. Figures 1 and 2 are of positive monopoles. Of significance to note is the large cotton ball at the center and up. The following is of a negative monopole. Of significance to note is the complete absence of a large cotton ball at the center and up. The following is of a positive monopole taken by cell phone in Ottawa, Canada, circa March 2015. The following two images are of positive monopoles taken by cell phone over Brantford, Ontario north of Lake Erie circa, spring nineteen fourteen. The cotton ball effect is obvious in both. 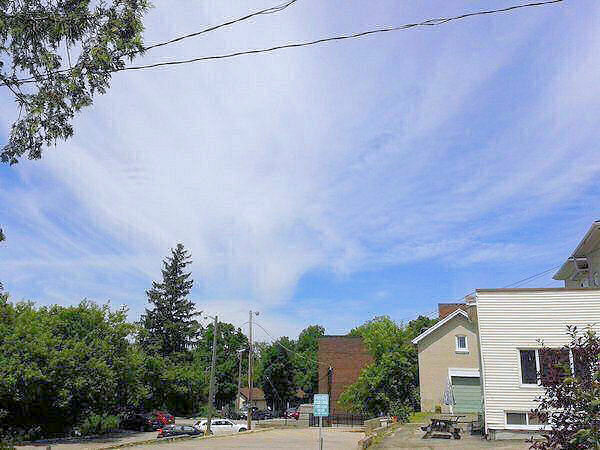 The two following images taken by cell phone over Paris, Ontario just west of Brantford circa, March nineteen fifteen are of the very rare occurrence of a positive monopole and negative monopole pair seen together. Of significance to note in the first figure is the very large cotton ball at the center and up. The negative monopole was taken from the exact same location at the exact same time exactly one hundred and eighty degrees in the opposite direction. Though not as well formed, of significance to note is the absence of a large cotton ball at the center. Note also that it bears a somewhat similarity to Figure 3. While pretty good, the two photographs do not do the whole formation justice. All of the radial lines from the one continue overhead like a panoramic roof into the other, comprising a complete bar-magnet field like signature overhead that can be followed by eye from pole to pole. Occasionally two or more monopoles will be present at the same time. The radial rays will criss cross, often mistaken for Chemtrails. The tell tale to look for is radial convergences. When three or more are up at the same time, the sky can look like broken glass. The following was taken in Ottawa, Canada circa, August 2014. Phenomenon like these are all over the place every day. If you are alert you will even see them in the backgrounds of TV, motion pictures, newspapers, and the Internet. 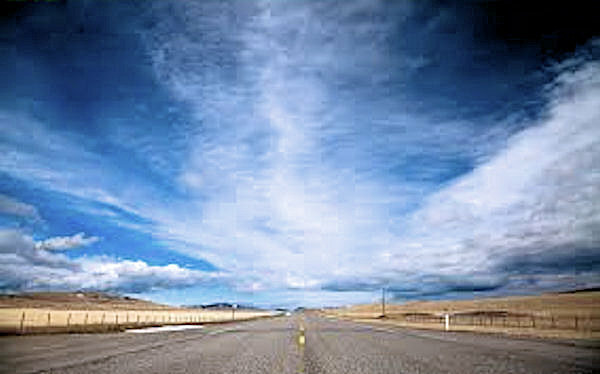 The following was taken from the movie ‘Desperation’, filmed in Nevada, USA circa 2006. The following image was found on the Internet, taken the morning after a very large fire occurred in downtown Los Angeles circa, December 2014. The following image was also found on the Internet, taken in Cahokia Ill., date unknown. The following two images were taken from Google.com/images/sky, dates and locations unknown. Mother Ships reflect differently, being very long and having a much larger and more diffuse magnetic field than scout ships. Mother Ships produce a much more uniform and symmetric radial scalar effect. The dominant ionization effect of the scout ships usually drown out the subtler ionizations of the Mother Ships. Usually the scout ship reflections will be visible but not the Mother Ship. Occasionally, a Mother Ship reflection will be visible but not the scout ships due to the type of ionized cloud moisture present. Mother ships are not mono poles, having both a north and south pole, which is how the respective south and north scout ship monopoles serve to anchor them. The following image from Ottawa, Ontario circa mid nineties is the subtler reflection of a cigar shaped Mother Ship. 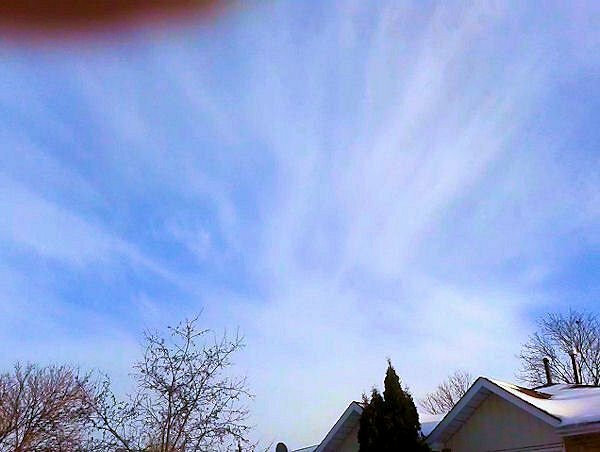 The following image from Brantford, Ontario circa, January 2015 is of a cigar shaped Mother Ship reflection in the process of fading out due to a dry air mass moving in. For complete information about the Heavenly Host and how the higher dimensions work through those in the Heavenly Host, see the rest of the Revelatorium of Alpha and Omega at: http://www.revelatorium.com. Like the information above, the Revelatorium is not what you have been taught, it is what you should have been taught. The Revelatorium punches straight though the veil of three and a half million years of Mentallized Illusion, connecting you directly to Reality, where Reality includes a nine hundred trillion light year Creation still within its infancy sitting on the other side of the veil. The Revelatorium is given as a handbook for your eventual ascension back to the fifth dimension where you belong. The bottom line of Creation is the fifth dimension. Every Planet and every Starr in Creation has a population in its higher dimensions. The third dimensional population on Earth is an anomaly, Ill consequence of the Luciferian Rebellion of the Cosmic Overplus, now ended and becoming erased from Creation forever in the all encompassing inter dimensional action called Armageddon already well underway. By revealing to you who the Heavenly Host are and why they are here, you will believe start believing in Ufos whether you have seen one or not. You need to read The Revelatorium all the way through to get a complete understanding of what these phenomenon are and what Reality is actually all about, as the Radionnic Ships tie in directly to the whole of Creation comprising a full thirteen dimensions. It is important to remember that the purpose of this Starrgram is to direct you to the Revelatorium at large and not the other way around. And also that the Revelatorium is by far the greater story. The Revelatorium is about Reality, which involves all eighteen dimensions of the Creators. Focusing all of your attention on UFOs in order to acquire an off-world knowledge is like focusing your attention only on automobiles in order to try and learn what Planet Earth is all about. Both ‘The Revelatorium’ and a mirror copy titled ‘The Intelligent Design of Creation’ are also for sale as paperbacks, either through the publisher or on Amazon. You are free to repost or use any part of this information, or all, anyway you like as long as you provide a website link or reference to the Revelatorium as source.